Jerusalem – Family of Nidal Abu Rmaila stands on the rubble of their house that was demolished by Jerusalem municipality bulldozers in al-Maghariba gate area under the pretext of non-licensing. Israeli forces have continued with systematic attacks against Palestinian civilians and their property in the occupied Palestinian territories (oPt) for the reporting period of 28 May- 03 June 2015. During the reporting period, a Palestinian civilian died of wounds he sustained during the latest Israeli offensive on the Gaza Strip. Israeli forces continued to use force against Palestinian civilians participating in peaceful protests in the oPt and against fishers sailing within the allowed area. Moreover, they continued to open fire at farmers and agricultural lands in border areas along the Gaza Strip. During the reporting period, Israeli forces wounded 7 Palestinian civilians, including a child, 4 of whom were wounded in the West Bank and the other 3 ones, including 2 fishers and a farmer, were wounded in the Gaza Strip. In the Gaza Strip, a Palestinian medical source declared on 28 May 2015 Sa'id al-Nadi (55,) from Jabalia in the north of the Gaza Strip, died of wounds he sustained during the latest Israeli offensive on the Gaza Strip. 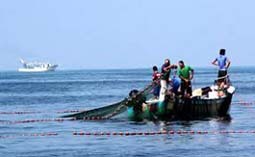 On 01 June 2015, 2 Palestinian fishers were wounded when Israeli gunboats opened fire at Palestinian fishing boats sailing within 4 nautical miles off northern Gaza City. As a result, two fishers were wounded. On 03 June 2015, a Palestinian farmer was wounded when Israeli forces stationed along the border fence opened fire at a group of farmers, who were reaping wheat in the east of Khuza'a village, east of Khan Yunis in the south of the Gaza Strip. In the context of targeting fishers, in addition to the abovementioned attack on fishermen, Israeli navy forces opened fire thrice at fishermen sailing in the allowed area. They arrested 5 fishers, including a child, but released 4 of them later. Moreover, Israeli forces seized 2 fishing boats that were sailing off Deir al-Balah shore, in the central Gaza Strip. In the context of targeting border areas, in addition to the abovementioned attack on farmers, Israeli forces stationed along the border fence opened sporadic fire twice at border areas, south of the Gaza Strip, but neither casualties nor material damage were reported. In the West Bank, Israeli forces continued the use of excessive and systematic force against peaceful protests organized by Palestinian civilians and Israeli and international solidarity activists against the construction of the annexation wall and settlement activities in the West Bank. As a result, 4 protestors, including a child, were wounded. During the reporting period, Israeli forces conducted at least 64 military incursions into Palestinian communities in the West Bank and 7 ones in East Jerusalem. During these incursions, Israeli forces arrested at least 61 Palestinians, including 14 children. Twenty-one of these Palestinians, including 3 children, were arrested in East Jerusalem. Among the arrested was Ahmed Khdair (34), a journalist and activist at the International Solidarity Movement, who was arrested from his house in Nablus, and Khaled Saleh Hussein Abu Zaina (55), who was arrested from his house in Jenin refugee camp too. Furthermore, Israeli forces arrested 3 leaders of the Popular Front for the Liberation of Palestine (PFLP) in Tulkram and Qalqilya. In the Gaza Strip, on 03 June 2015, Israeli forces conducted a limited incursion in the east of al-Shouka village, east of Rafah in the south of the Gaza Strip. They levelled lands along the border fence. On Tuesday, 02 June 2015, bulldozers of the Israeli municipality in East Jerusalem demolished 2 under-construction houses in Wadi Helwa neighbourhood in Silwan village, south of the old city, under the pretext of non-licensing. On the same day, Israeli municipality demolished parts of a house belonging to the family of Rafiq Ahmed al-Salayma on Saladin Street in East Jerusalem, under the pretext of non-licensing. On 29 May 2015, Israeli police officers beat and arrested 3 members of Moheisen family for no reason. The 3 civilians were attacked while being in a vehicle at the entrance of al-Esawiya village, north of East Jerusalem. On 28 May 2015, Israeli forces closed the entrance of a room on the underground floor of the Ibrahimi Mosque in the center of Hebron for "security reasons". They changed the door's lock and refused to give its key to mosque servants. On Tuesday, 02 June 2015, Israeli forces moved into Rummana village, northwest of Jenin. They deployed in Palestinian farmlands and informed farmers they had an order to bridge an artesian well and 2 agricultural rooms under the pretext they were not licensed. An Israeli bulldozer demolished the well and rooms and no more incidents were reported. On Sunday midnight, 31 May 2015, a number of settlers threw stones at a house in Tal al-Rumaida neighbourhood in Hebron. They also set fire around the house, as a result, some stuffs belonging to family were burnt, but no casualties were reported. On Tuesday, 02 June 2015, a settler in a mini truck threw stones at a Palestinian civilian vehicle. As a result, the windshield was broken and the back of the car sustained damage. During the reporting period, Israeli soldiers used excessive force against peaceful demonstrations organized by Palestinian civilians, international and Israeli human rights defenders in protest at the construction of the annexation wall and settlement activities in the West Bank. As a result, 4 civilians, including a child, were wounded. Following the Friday prayer, on 29 May 2015, dozens of Palestinian civilians and international and Israeli human rights defenders organized a peaceful demonstration in Bil’in, west of Ramallah, in protest at the construction of the annexation wall and settlement activities. The protestors marched by the annexation wall and tried to cross the fence. Israeli soldiers stationed behind the wall, in the western area, and a large number of soldiers deployed along it, fired live bullets, tear gas canisters, rubber-coated metal bullets, sound bombs and wastewater at them and chased them into the olive fields. As a result, a number of protestors suffered tear gas inhalation and others sustained bruises as they were beat up. Around the same time, dozens of Palestinian civilians organised a peaceful demonstration in the centre of Ni’lin village, west of Ramallah, in protest at the construction of the annexation wall and settlement activities. The demonstrators took the streets and headed to the annexation wall. Israeli forces closed the gates of the wall with barbwires and prevented the demonstrators from crossing to the land behind it before they responded by throwing stones. Israeli soldiers fired live ammunition, rubber-coated metal bullets, sound bombs and tear gas canisters at the civilians, and chased them into the village. As a result, a number of protestors suffered tear gas inhalation and others sustained bruises as they were beat up by Israeli soldiers. Also following the Friday prayer, there was the weekly protest against the closure of the eastern entrance of Kufor Qaddoum village, which was closed by Israeli forces since the Intifada. Once the protestors approached the closed entrance, Israeli forces fired rubber-coated metal bullets, tear gas canisters and sound bombs. They also sprayed skunk water other the protestors. However, no direct casualties were reported. On Thursday, 28 May 2015, dozens of Palestinians gathered at the southern entrance of al-Jalazoun refugee camp, north of Ramallah. They were about 300 meters away from the fence of "Beit Eil" settlement. Israeli forces stationed in the area fired live ammunition, rubber-coated metal bullets, sound bombs and tear gas canisters. As a result, a number of protestors suffered tear gas inhalation and others sustained bruises as they were beat up. Following the Friday prayer, on 29 May 2015, dozens of Palestinians gathered at the southern entrance of al-Jalazoun refugee camp, north of Ramallah. They were about 300 meters away from the fence of "Beit Eil" settlement. Israeli forces stationed in the area fired live ammunition, rubber-coated metal bullets, sound bombs and tear gas canisters. As a result, a number of protestors suffered tear gas inhalation and others sustained bruises as they were beat up. Also ffollowing the Friday prayer, dozens of Palestinians gathered at the western entrance of the Silwad village, northeast of Ramallah, on the road between Silwad and Yabroud villages, near Bypass road (60), in protest at the Israeli policies. The protestors set fire to tires and threw stones and Molotov Cocktails at the aforementioned road and Israeli soldiers. In response, Israeli soldiers stationed in the area fired live ammunition, rubber-coated bullets, sound bombs and tear gas canisters at the protestors. As a result, 2 civilians were wounded and then taken to Palestine Medical Compound in Ramallah to receive medical treatment. A 24-year-old civilian sustained a bullet wound to the right leg and another 24-year-old civilian sustained a bullet wound to the left leg. Also ffollowing the Friday prayer, dozens of youngsters gathered from different areas of Ramallah and al-Bireh in the vicinity of Ofer detention facility, southwest of Ramallah, to protest at Israeli policies. They headed towards the facility’s gate that was closed by Israeli soldiers. They set fire to tires and threw stones and empty bottles at the soldiers. Israeli forces deployed around the detention facility and started firing live and rubber-coated metal bullets, sound bombs and tear gas canisters. As a result, 2 civilians sustained wounds and were taken to Palestine Medical Compound in Ramallah. A 15-year-old child sustained a bullet wound to the right thigh and a 20-year-old child sustained a bullet wound to the left thigh. At approximately 10:00 on Saturday, 30 May 2015, a number of activists from the Popular Committees against Annexation Wall and Settlement Activities and other human rights activists organized a protest in fron of "Beit Bracha" building, adjacent to bypass road (60) between al-Aroub refugee camp and Beit Ommar village, north of Hebron, because Israeli forces fixed a security fence and surveillance cameras around the building and its vicinity and declared it as part of "Gosh Etzion" settlement. Israeli officers and police officers surrounded the place, prevented the participants from approaching the main gate and attacked them. The protestors refused to leave. Israeli forces fired sound bombs at them and arrested Yusef Abdul Hamid Abu Maria (44) and 3 international activists. It should be noted that Israeli media reported earlier that settlers rebuilt the building in order to establish "Beit Bracha" settlement. The building and other buildings are under the supervision of Beit Ommar municipality. Hebron: Israeli forces established 11 checkpoints all over the city. On Thursday, 28 May 2015, Israeli forces established 2 checkpoints at the entrance of al-'Aroyub refugee camp, north of Hebron, and at the entrance of al-Tabaqah village, south of Duram southwest of Hebron. On Friday, 29 May 2015, Israeli forces established a checkpoint at the entrance of Karsa village, south of Dura, southwest of Hebron. On Saturday, 30 May 2015, Israeli forces established a checkpoint at the entrance of Karsa village, south of Dura, southwest of Hebron. On Monday, 01 June 2015, Israeli forces established a checkpoint at the entrance of Beit Ummar village, north of Hebron. On Tuesday, 02 June 2015, Israeli forces established 3 checkpoints at the entrances of al-'Aroub refugee camp, north of Hebron; al-Samou'a village, south of the city; and Beit 'Awa village, southwest of the city. The israeli forces handed Ahmed Khalil Abu Hasem (46) from Beit Ummar village, north of Hebron, a summons to refer to the israeli Intelligence in "Gosh 'Etzion" settlement, south of Bethlehem, after stopping his car at the checkpoint established at al-'Aroub entrance. On Wednesday, 03 June 2015, Israeli forces established 3 checkpoints at the entrances of Sa'ir village, east of Hebron; al-Fawar refugee camp, south of the city and Taramah village, southeast of the city. Ramallah: Israeli forces established 7 checkpoints all over the city. On Thursday, 28 May 2015, Israeli forces established 2 checkpoints at the entrance of 'Aboud village, northwest of Ramallah and at the entrance of Termes'aya village, north of the city. On Friday, 29 May 2015, Israeli forces established 3 checkpoints at southern entrance of al-Nabi Saleh village, northeast of Ramallah; under the bridge of Yabrud village, northeast of the city; and at the entrance of Na'ilin village, west of the city. On Saturday, 30 May 2015, Israeli forces established 2 checkpoints at the entrance of Deir Abu Mesh'al village, northwest of Ramallah, and the entrance of Qebia village, west of the city. Qalqilya: Israeli forces 5 checkpoints all over the city. On Thursday, 28 May 2015, Israeli forces established two checkpoints at the entrance of Kafr Qaddoum, northeast of Qalqilya, and on the road between the villages of Hajah and al-Fondq, east of the city. On Friday, 29 May 2015, Israeli forces established a checkpoint at the entrance of Kafr Qaddoum, northeast of Qalqilya. On Saturday, 30 May 2015, another checkpoint was established at the aforementioned village entrance. Oat approximately 17:00 on Tuesday, 02 June 2015, israeli forces established a checkpoint on the road to the entrance of Kafr Qadoum village, northeast of Qalqilya. On Wednesday, 03 June 2015, they established another checkpoint in the same area. Jenin: Israeli forces have continued to impose severe restrictions on the movement of Palestinian civilians. On Tuesday, 02 June 2015, Israeli forces established a checkpoint at the entrance of Kafr Qoud village, west of Jenin. Jericho: Israeli forces have continued to impose severe restrictions on the movement of Palestinian civilians. On Friday, 29 May 2015, Israeli forces established 2 checkpoints at the entrance of Fasayel village, north of the city, and at the southern entrance of Jericho. Tulkarm: Israeli forces have continued to impose severe restrictions on the movement of Palestinian civilians. On Thursday, 28 May 2015, Israeli forces stationed at ‘Annab military checkpoint which is established on the road between Tulkarm and Nablus, east of the city, tightened their restrictions against civilians and obstructed their movement. The tightening recurred at the aforementioned checkpoint at approximately 14:30 on Saturday, 30 May 2015 and at approximately 22:30 on the aforementioned Saturday and at approximately 12:00 on Sunday, 31 May 2015. On Tuesday, 02 June 2015, Israeli forces established a checkpoint on the main road between Tulkarm and Nablus near the intersection of Beit Leed village, east of Tulkarm. 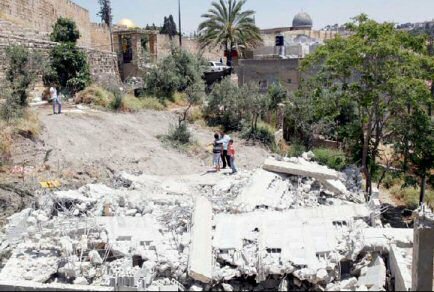 On Tuesday, 02 June 2015, bulldozers of the Israeli municipality in East Jerusalem demolished 2 under-construction houses in al-Helwa valley neighbourhood in Silwan village, south of the old city, under the pretext of non-licensing. Nidal Abu Khaled, the owner of the 2 houses, said to a PCHR fieldworker that at approximately 04:30 on Tuesday, 01 June 2015, Israeli special forces and police officers accompanied by the municipality vehicles raided a number of houses belonging to his family. They surrounded the area and started demolishing the 2 houses. When a number of his family members tried to stop them, Israeli officers beat them and sprayed pepper spray over them. As a result, Hashem Abu Khaled (22) sustained wounds to the face and head, was arrested and taken for medical treatment; Nour al-Din Abu Khaled (22) sustained wounds to the face; Ezz al-Din Abu Khaled (24) sustained wounds and bruises to the eye; and Fatima Abu Khaled (70) suffered tear gas inhalation. Abu Khaled added that his family started building the 2 houses in November 2014, during which Israeli Antiquities Authority ordered them to stop construction. Moreover, the Israeli municipality issued a decision to stop building and demolish what was built. The family could stop the demolition order several times, but Israeli municipality bulldozers demolished the 2 houses on that day. At approximately 06:00, on the same day, Israeli municipality demolished a part of a house belonging to the family of Rafiq Ahmed al-Salayma on Saladin Street in East Jerusalem, under the pretext of non-licensing. Jaber Salayma, his cousin, said to a PCHRs fieldworker that Israeli forces had raided the house of his cousin Rafiq at approximately 06:00. They forced the house's occupants out and obliged them to go to the above-mentioned street. He added that the house was built a long time ago, but because the family got bigger, they built another floor roofed with metal and bricks. However, the family was surprised by the municipality officers demolishing it with manual demolishing tools without prior warning. It should be noted that the house shelters 10 family members, the majority of whom are children. On Sunday midnight, 31 May 2015, a number of settlers threw stones at a house belonging to Emad Awni Abu Shmaisa (35) in Tal al-Rumaida neighbourhood in Hebron. They also set fire around the house, as a result, some stuffs belonging to family were burnt, but no casualties were reported. It should be noted that Abu Shmaisa family has been always attacked by settlers. The last attack was when a toxic substance put in the water tanks on the roof of the house. At approximately 23:30 on Tuesday, 02 June 2015, a settler in a mini truck threw stones at a Palestinian civilian vehicle. As a result, the windshield was broken and the back of the car sustained damage. The vehicle belongs to Mojahed Sulaiman Dawabsha (28), a veterinarian from Doma village, southeast of Nablus. Wadi Hilweh Information Center monitored the Israeli violations in the city of Jerusalem during the month of May 2015. The occupation forces and settlement organizations continued their assaults in the city of Jerusalem under the protection of the Israeli government resulting in the Martyrdom of Emran Abu Dheim from Jabal Al-Mukabber who was shot in the village of Al-Tur. He forces also arrested 135 Palestinians and isolated 26 others from Al-Aqsa Mosque and also demolished three residential apartments and one building in the city. The most significant assault in May occurred when the forces murdered the 42-year old Emran Abu Dheim with cold blood while he was in the village of Al-Tur. The forces shot him under the pretext of attempting to run-over soldiers in the area. Emran left his house at 8:30 a.m. on Wednesday 20/5/2015 heading to work in Mount of Olives. Witnesses said that the Martyr tried to make a turn in the middle of the street at the intersection of Al-Tur but was stopped because one truck was unloading vegetables to a nearby store. Israeli forces were stationed on both sides of the street and they suddenly opened fire towards him while he was driving. Abu Dheim has five children where the oldest is 14 and the youngest is 16 months old. The occupation intelligence raided the commercial stores immediately after Abu Dheim was murdered and confiscated the recordings of the surveillance cameras to hide their cold-blooded murder. Murdering was not enough for the occupation authorities as they raided the Martyr’s house and searched it, and also interrogated his wife. The authorities then gave the Martyr’s body to his family under strict conditions by specifying the number of participants in his funeral as well as the time of the funeral. The extremist Jewish groups continued their regular break-ins to the courtyards of Al-Aqsa Mosque especially on the anniversary of occupying the city of Jerusalem and during the so-called “Shavuot” (Descent of the Torah). In May, more than 690 extremists and 355 Israeli forces broke into Al-Aqsa courtyards. Wadi Hilweh Information Center also monitored the occupation soldiers kidnapping of three females from the courtyards of Al-Aqsa Mosque. The forces assaulted the females as well as Al-Aqsa guards and other young men to secure the settlers’ break-ins. The Islamic Awqaf intervened and forced the police to release the females under no conditions. 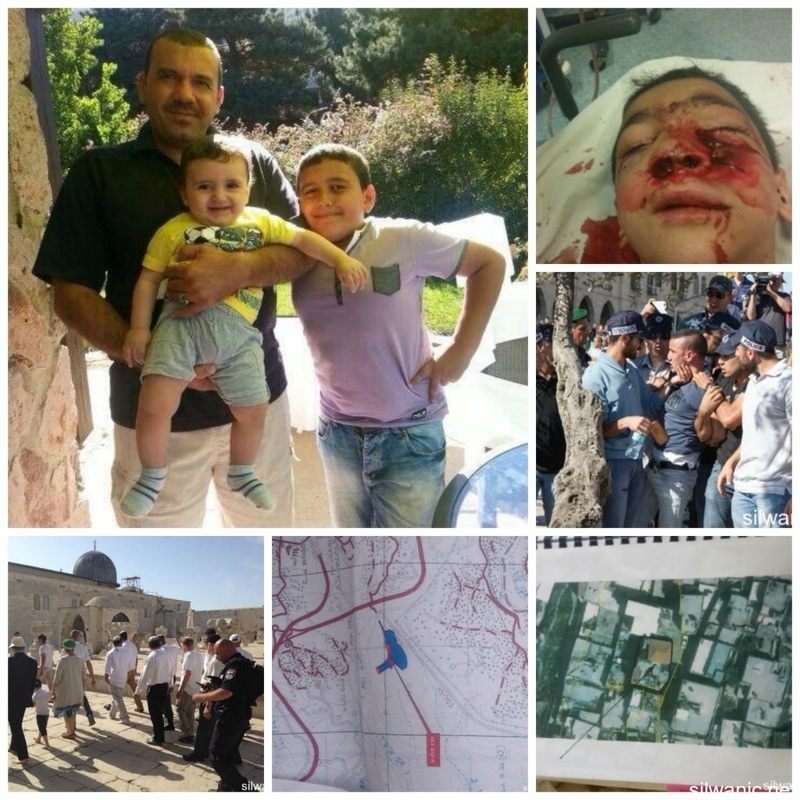 During May, a group of settlers assaulted Al-Aqsa guards and some young men during their tour inside the Mosque. The settlers deliberately provoked the people present inside Al-Aqsa through chants of “the Temple is here, Dome of the Rock needs to be removed”. 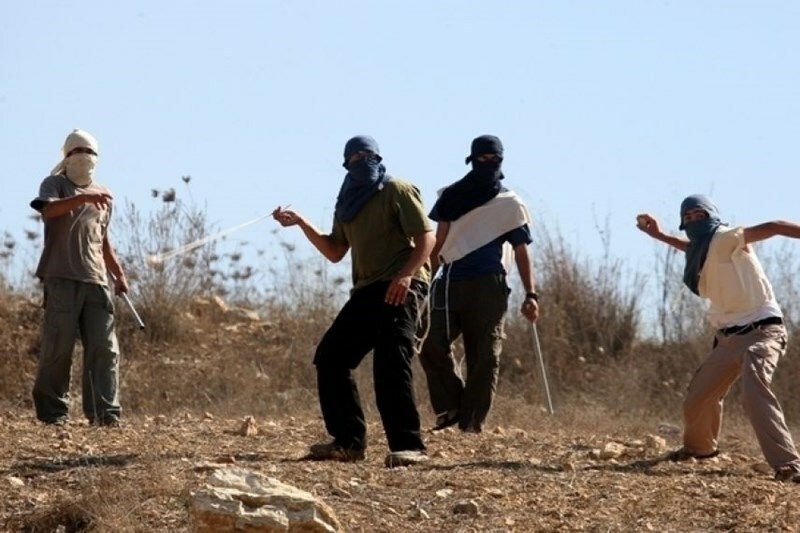 The guards confronted the settlers but the settlers assaulted them with the help of the occupation police. The occupation authorities isolated 26 Palestinians from Al-Aqsa Mosque for durations that varied between one week and six months. Among those isolated were three minors, nine women and Sheikh Kamal Khatib, deputy of Islamic Movement in the 1948 lands, who was isolated for 6 months. The forces also seized 130 meals prepared for fasting Muslims who were planning to break their fast inside the courtyards of Al-Aqsa. The Information Center monitored the arrest of nearly 135 Jerusalemites including 17 females, 47 minors, a 12-year old child from the Old City of Jerusalem and three old people where the oldest is 69 years old. The arrests mostly took place in the neighborhoods of Silwan (54 detainees), the Old City of Jerusalem (25), the village of Esawyeh (16), Beit Hanina (10) and other neighborhoods such as Al-Tur, Beit Safafa, Shu’fat refugee camp, Sur Baher and Jabal Al-Mukabber. Among the detainees were five school-students that were arrested while carrying their book bags as they were heading to school or leaving school; they were all arrested under the pretext of throwing stones. The occupation forces’ assaults against Jerusalemites and their properties continued in the month of May and the “snipers unit” targeted the 10-year old Yehya Sami Amoudi from Shu’fat refugee camp with a rubber bullet in his eye causing him fractures in the skull, nose, jaw in addition to damage to his left ear; note that his left eye was removed due to the injury. It is noteworthy that the occupation forces are stationed on a daily basis in a building established at the entrance of Shu’fat refugee camp across from the military checkpoint, and deliberately stir up trouble in the afternoon when the students leave their schools. During May, the Israeli occupation authorities decided to isolate the 43-year old Mona Shalabi from the city of Jerusalem after her “family reunion” application was denied for “security reasons”. Mona Shalabi is married to the activist and former secretary of Fateh Movement in Jerusalem Omar Shalabi. She had submitted her application 23 years ago and has been living in the neighborhood of Al-Sowaneh since then. She has six children who were all born in the city of Jerusalem. The police also arrested a tractor driver near Herod’s Gate in Jerusalem under the pretext of attempting to run over soldiers, and detained five Jerusalemites in Al-Tur under the pretext of attempting to run over a settler in the area of French Hill; they were subject to field interrogation and were precisely searched. In an attempt to limit the movement of Jerusalemites, the occupation authorities placed cement cubes in a land in the village of Jabal Al-Mukabber that is used as a parking lot for the locals of the village. The Israeli police also violated the freedom of speech and suppressed a sit-in that was organized to condemn the march of “Unification of Jerusalem”, and assaulted Palestinians while providing full protection to settlers. Within the policy of confiscating lands in Jerusalem, the occupation authorities decided to seize 8200 meters of land in the eastern part of Esawyeh as ordered by the Commander of Israeli occupation forces “Netsan Alon”. The forces also assaulted the Jerusalemite Nihaya Mheisen while she was heading home using public transportation. The forces made all passengers leave the vehicle and threaten to use force if she doesn’t take off her clothes in order to search her; her husband and son were also assaulted and arrested. During last month, the daily clashes did not stop in the Jerusalemite neighborhoods especially in Silwan, Al-Tur, Esawyeh and Shu’fat refugee camp due to the presence of settlers in the settlement outposts or the presence of occupation forces who establish checkpoints in the streets; note that Israeli forces used live bullets in the neighborhood of Ein Al-Lozeh in Silwan in May. The light rail’s guards continued their assaults against Jerusalemites and opened fire towards the 35-year old Hatem Salah from Shu’fat refugee camp and injured him in his leg. The guards claimed that Hatem attacked them and intended to carry out a stabbing attack, but the police revealed the next day that Hatem did not intent to stab the guards and did not have any sharp tools on him and was only carrying his belt in his hand. It turned out that the guards had assaulted Hatem a day before he was shot. The guards also assaulted three members of Abed Rabbo family (girl, woman and young man) after claiming that the girl did not buy a ticket for the train; they were assaulted and beaten with the help of Special Forces personnel. Wadi Hilweh Information Center-Silwan obtained a map and aerial photographs illustrating one of the plans of “Ateret Cohanim” in the “Middle Neighborhood” and revealed their intention to confiscate nearly 5200 square meters under the pretext of being owned by the Jews of Yemen since 1881. The targeted area is divided into 6 pieces of land (numbers: 73, 75, 88, 95, 96 and 97) and the settlement organization claim that the Israeli Supreme Court approved the ownership of settlers from Yemen to lands in Batn Al-Hawa. The lands at risk of being confiscated currently have 30-35 residential apartments established on them where 80 families and nearly 300 individuals live. All the residents have been living in the neighborhood since the 1960’s after they bought the lands and property from the previous owners using official documents. Settlers also took over three apartments owned by Abu Nab family in the “Middle Neighborhood” in Silwan under the protection of occupation forces. During May, the occupation municipality’s bulldozers did not take a break from demolishing Jerusalemites’ establishments under the pretext of building without a permit. The municipality demolished three residential apartments and one under-construction building that consisted of 8 apartments and three commercial stores in Ein Al-Lozeh, Wad Qaddoum and the neighborhood of Sweih in Silwan. 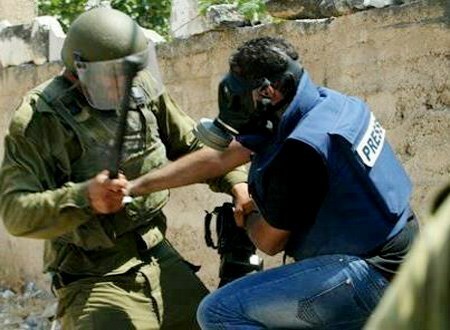 Israeli Occupation Forces (IOF) carried out last month 35 violations against Palestinian journalists, Palestinian Information Ministry revealed Tuesday. The ministry has documented more than 30 violations against journalists as part of the Israeli systematic policy to prevent them from covering the occupation’s real image. The documented violations include attacking journalists, targeting them with tear gas bombs, ill-treatment, humiliation, arrests, confiscation of their equipments, travel ban, and preventing them from covering events. Israeli violations have notably escalated in occupied Jerusalem over the past period, where journalists were targeted by both Israeli forces and settlers. On Tuesday, 02 June 2015, Israeli naval gunboats chased and opened fire at a Palestinian fishing boat sailing off northern Gaza shore wounding two fishers. On Monday morning, 01 June 2015, Israeli naval forces also arrested five Palestinian fishers, including a child, while fishing off Gaza shore. The Palestinian Centre for Human Rights (PCHR) condemns these attacks against Palestinian fishers that deny them their right to freely practice fishing in the Gaza sea. PCHR also expresses its concern over the continued Israeli policy of targeting fishers' livelihoods in light of the illegal naval blockade imposed on Gaza sea and in conjunction with the sardine season as well. These fishers were identified as: Adel Sa'id Abu Reyala (42), Yusef Adel Abu Reyala (19), Mohammed Ibrahim al-Najjar (35), Rami Ibrahim al-Najjar (30) and Ibrahim Hani al-Najjar (11). Four of them were released on Monday midnight, while Rami al-Najjar has remained in custody. A human rights group working in the 1948 occupied Palestinian territories declared that Jewish settlers enjoy impunity for crimes committed against the Palestinians in the West Bank citing the fact that the Israeli police take no serious action to deal with the attacks by the settlers against the Palestinians in the West Bank. The group, known as "Yesh Din" (i.e. there is a law), follows up and documents the settlers’ attacks against the Palestinians. The group published a report last month on its website stating that the investigations conducted by the police only result in a very small proportion of indictments and convictions. According to the report, the group followed up 1067 investigation files from 2005 until the end of 2014, yet there were no indictments brought except in 7.4% of those files, which means no more than 70 files. The report pointed out that the majority of files were closed at the end of the investigation without indictments, and the overwhelming majority of 85% were closed because of the failure of the investigation and the failure of investigators to find out the suspects or to collect sufficient evidence to file indictments. The report stated that 605 investigation files were closed because of not knowing the offender, which refers to the police's failure to find out the suspects of the crimes. Also, 204 files were closed because of the lack of evidence, which refers to the investigators’ failure to collect sufficient evidence to file indictments against the suspects accused of crimes, including attacks against Palestinians or their properties or the seizure of private Palestinian lands. The report also indicated that 77 files were closed under the pretext of "lack of a criminal charge", which means that "there is no criminal offense committed, or that the suspect has nothing to do with the crime committed." In this context, the Yesh Din group filed an appeal on 26 investigation files, after the legal staff had examined the files, and found that the decision to close them was not reasonable. The report also showed that even in the few cases where indictments were brought forward, one third of the judicial process ends with full or partial conviction, and almost a quarter (22.4%) are canceled or written off, while in 22.8% of the indictments, the court avoids the conviction of the accused despite the decision that they have committed the violations attributed to them. The data showed that indictments were brought forward with full conviction in six files only, while 13 files ended with partial conviction. Besides, the report stated that based on the investigation materials, the investigations were poorly conducted with much failures and shortcomings in all stages of the investigation. In addition, the investigations were not conducted under the basic investigation procedures, and some of the failures concern not patrolling the crime scene, or doing so long time after committing the crime, which makes it hard to find evidence of criminal offenses. The report also listed other failures; such as conducting an unserious and unprofessional investigation at the crime scene, as well as making no effort to find witnesses. The report stated that law enforcement in the West Bank faces a structural problem due to the incomplete distribution of powers between the Israeli army and the police, which resulted in insufficient cooperation leading to these failures. According to the report, the problem appears clearly in the frequent absence of the police in the areas where the crimes were committed, and also in the serious failures in the performance of the occupation army soldiers who arrive at the crime scene, yet often stand aside and do not act to stop the crime. They don’t detain settlers, nor do they try to guard the crime scene until the arrival of the police. Moreover, the report put forward another issue that the Palestinians don’t trust in the capabilities or willingness of the police to provide them with assistance or to investigate their complaints. According to Yesh Din, this can be easily seen through the majority's decision not to make a complaint to the police. Most cases of attacks on Palestinians are closed after under the “unknown perpetrator” clause. The police have wondrous ways of unseeing criminals. At the center of our new report, Mock Enforcement, dealing with the continued failure of Israel to enforce the law on Israeli civilians in the West Bank who harm Palestinians, stands a depressing piece of data: the police’s failure rate in investigating these crimes stands at 85.3 percent. The report examined 996 cases closed by the police, and found that the main clause for closing them is UP – “unknown perpetrator.” 593 of the cases examined were closed for that reason, which means the police did not manage to find suspects who committed the crime. The clause is the official reason given by the police for the decision to close the case. The Israeli Police Command notes nine clauses for closing an investigative case, among them lack of guilt, lack of sufficient evidence, the fact that the suspect is a minor and, of course, unknown perpetrator. The question that keeps surfacing when a case is closed due to UP asks just how extensive was the police’s search for the criminals. An examination of a series of cases shows that all too often that search was partial at best. At worse, it is farcical. Let’s deal with some examples, since there are some facts that simply cannot be conveyed by numbers. On September 3rd 2009, three Israeli civilians – two of them wearing a hood, one with his face visible who was holding a stick and was walking a dog – attacked Ibrahim Tawil, a resident of the village of Faratha, on his land. The three attackers were joined by three others, all of them wearing hoods, and together they removed Ibarhim’s belt and assaulted him with it. They then undressed him, stole his wallet and watch and left him in his underwear. In his police interrogation, Tawil identified the clear-faced attacker in the police album. However, an inner police memo claimed that according to intelligence, the person had no connection to the region or the incident. Had the police bothered to make the minimal effort and examined the suspect’s criminal record, it would have found that the attacker had a rich past of violence against Palestinians, including a conviction for using firearms. But this basic action was not undertaken, the suspect was not summoned for an interrogation and the case was closed under the UP clause. Let’s recap: even when the Palestinian victim identified an attacker known to the police — who attacked him with his face exposed — the police managed to avoid interrogating the suspect. We appealed, and the suspect was summoned for interrogation (a year after the incident) and denied his alleged involvement. The interrogator did not ask him for an alibi, and the case was closed – again – under the UP clause. Tawil, who lives near the Havat Gilad settlement outpost, isn’t very lucky. Two months after the first incident, on November 26th 2009, he was attacked by four hooded people who came from the direction of the outpost — two of them arriving on the scene with dogs. He was beaten with a stone on his head and a stick on his back. The timely arrival of other village residents probably prevented more serious damage. Tawil lodged a complaint with the police, describing the clothes they wore noting that he was also attacked two months earlier. The police closed the file a month later, again claiming the unknown perpetrator clause. Even though at the time the number of people residing in Havat Gilad was 20 at most, the police declined to use the simple method of checking who among them owns dogs fitting the description given by Tawil. Tawil, of course, is not the only victim whose attacker was never to be found. On March 17th 2011, a group of hooded Israeli civilians assaulted Sami Snoubar, a Palestinian working at construction in the settlement of Shiloh, striking his head with a metal bar and attacking him with pepper spray. The identification was partial in the extreme, relying on the testimony of a medic who identified two of them, but qualified his statement by saying he may have seen them at other incidents in the area. The police interrogated three suspects; all of them refused to cooperate with the investigation. Two of the suspects gave an alibi, which the Samaria Judea Police Department, displaying its usual diligence, failed to check. The case of the third suspect is more shocking: he refused to cooperate with the investigation, declining to give an alibi, and in response the investigator offered him an alibi (!) by saying that the police will allow him to call his boss so that the latter could provide him with an alibi. The case was closed under the unknown perpetrator clause. One of the most appalling cases is that of Yassin Rifa’i. On March 14th, 2011 a Civil Administration officer informed Rifa’I, a resident of the Palestinian village Anata, that the residents of the settlement of Talmon uprooted dozens of trees from his land – allegedly as vengeance for a murder. The management of the settlement accepted responsibility for the incident and compensated Rifa’I for the damage. The police interrogated the settlement’s security officer, who was asked whether he knew who committed the crime. The officer responded that he “preferred to keep the information to himself.” This, allegedly, is obstruction of justice, but the police did not pressure the security officer in any way, and he did not face any disciplinary action. Nor did the police try to find the Civil Administration officer who contacted Rifa’i. After all, it is much easier to scrawl “unknown perpetrator” on the case than try and find who the perpetrator really was. The picture that arises from these cases (and many others), backed up by data, is as gloomy as it is simple: the investigators are not really trying to find the suspects. It’s unclear whether this stems from a fear that success will lead to hostility toward them from the Jewish population; whether this is the spirit of command, saying “don’t succeed too much in this realm”; whether this is laziness or a quiet sympathy with the attackers. What is clear is that there is something beyond incompetence, something near-systematic. And when it becomes systematic, how can you blame the Palestinians who decided not to bother with lodging a complaint? 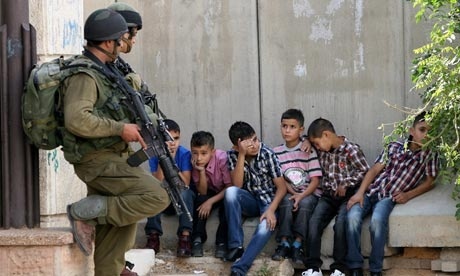 Israeli soldiers stand near Palestinian children arrested in Hebron. Palestinian Authority lawyer Hiba Masalha reported that young Palestinian detainees are being "terrified, threatened, and blackmailed" by Israeli authorities while detained. There are currently 68 Palestinian teenagers being held in Section 3 of Megeddo prison, where Masalha visited recently, and most of the detainees were arrested from an orphanage in Tulkarem in the Northern West Bank. 17-year-old Mahir Hussein, from Qalqiliya in the northern West Bank, told Masalha that Israeli soldiers had fired gunshots into the air to threaten him and two other teenagers when they were detained. The soldiers threatened to kill him and then beat him violently. Hussein was left bleeding with his hands and feet cuffed for 6 hours before being moved to a hospital in an Israeli military base where he got 24 stitches to seal the gaping wound in his head. He was transferred to al-Jalama interrogation center where he was beaten and mostly confined to a wooden chair with his hands and feet cuffed for a period of 20 days. Masalha also met with two other detainees, Wasim Taj and Ibrahim Salmi, both age 17, who reported similar experiences of "brutal" interrogation. Just last week, Issa Qarage, head of the prisoners' committee, stated that Israeli interrogators used "oppressive and brutal" methods to terrorize Palestinian detainees. There have been numerous reports of "widespread and systematic" abuse of Palestinian detainees by Israeli forces, including reports by the United Nations and Defense for Children. The Defense for Children report stated that 93 percent of children detained by Israeli forces were denied access to legal counsel, and many endured prolonged periods of solitary confinement for interrogation purposes, which is considered torture under international law.